Despite the lack of updates on the blog, adventure hasn’t been entirely absent in my life for the last year. It’s just that a couple of house moves (the most recent of which is into a house with gold skirting boards and purple grouting i.e. DIY ahoy) and new jobs (including helping to set up an entirely new organisation) for both me and Dave have meant that spare time is often thin on the ground. Add to that the transition from freelance to full time work (into a role where writing a weekly blogpost is often my responsibility), and the idea of willingly spending more time in front of a screen or composing words just seemed unlikely. But there has been adventure – I managed to get into the hills for a walking break or two with friends, such as the enjoyable trip in the early Autumn sunshine up to the North York moors. 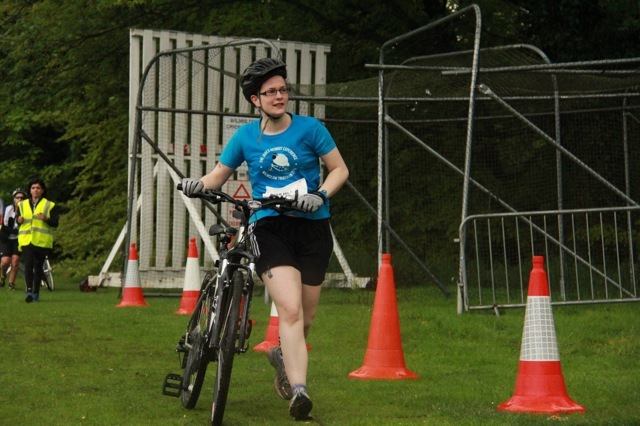 It was on that trip, just after Dave and I completed the Derby Triathlon, that I waxed lyrical about the fun of triathlon. 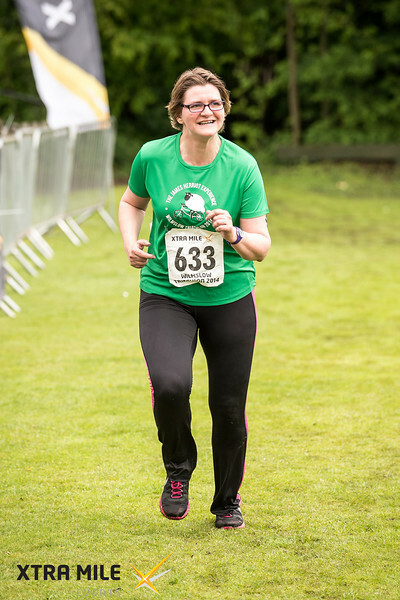 “It’s great”, I said, “you just have to be reasonably fit and fairly persistent, and you can get round with no training at all, like we did!”. So persuasive was I that I secured agreement that my walking companions would join me in another triathlon the next year. Things being what they are, with work, injuries and other things in our lives like major birthdays of family members, the five of us didn’t all make it to the starting line. 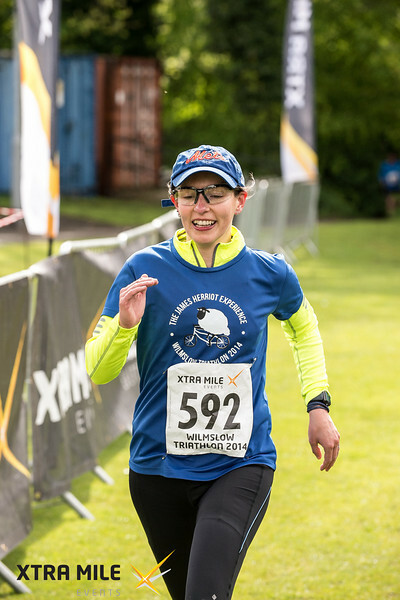 But last Sunday, Rachel and Steph joined me, shivering and soaking in the car park of a leisure centre in Wilmslow, questioning our sanity and about to start the Wilmslow triathlon as team ‘The James Herriot Experience’. Now you might think that, like the London Marathon, the really quick people would be put at the front, to set off first and get round quickly. And believe me, really quick people were in plentiful supply, with Team GB suits, pointy bike helmets and body fat percentages in the low single digits on show. But no, they get to have a relaxing lie in (who am I kidding? I bet they’ve already done a full workout and drunk a kale smoothie by 8am), whereas poor sods like us a.k.a. novices have to get up ridiculously early and start first. 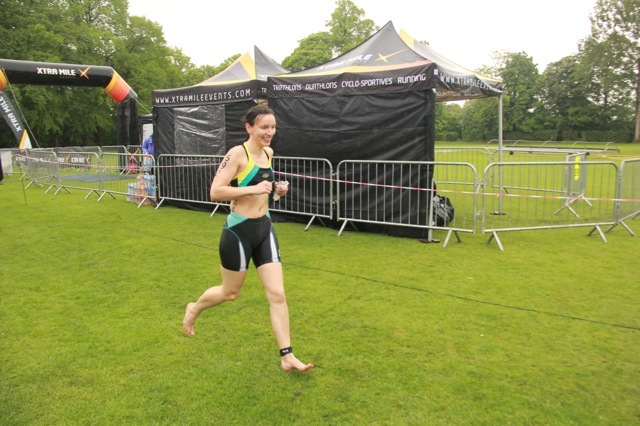 My vast experience of doing triathlon(s) meant that I was at least a little bit prepared for the field full of expensive bikes and toned people in flip flops. But there were plenty of new experiences to grapple with – what on earth do I do with these temporary tattoo numbers? How do I keep any of my stuff even slightly dry in the rain? And what do I wear when the weather changes rapidly from sunshine to showers (and hail)? 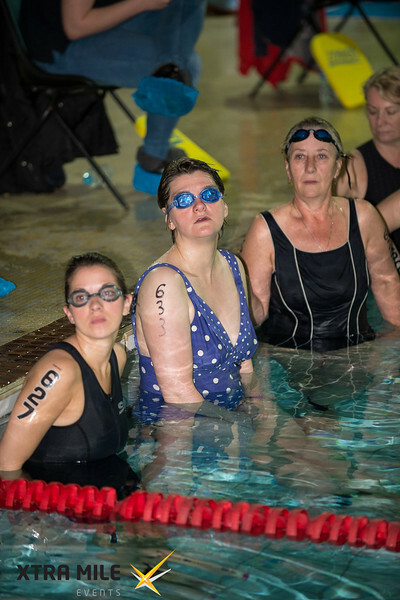 Steph and Rachel were allocated to an early wave, so by 7.10am they were poolside, being briefed on the route and rules. Steph was concerned her sports bra / bikini top might unzip itself. Rachel’s numbers wouldn’t stick to her arm so she sported a handwritten marker pen number. 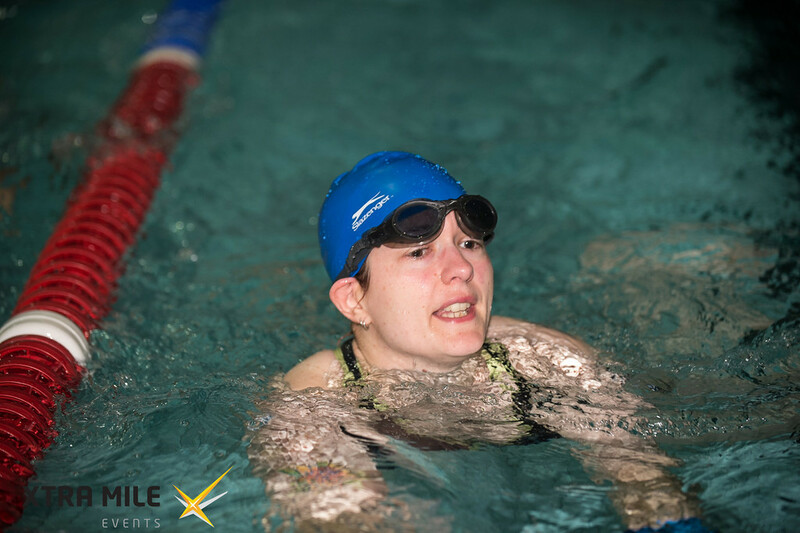 Rachel later explained that she’d had the unenviable realisation that the pool in which she trains is somewhat less than 25 metres, which meant her training hadn’t quite prepared her for the reality. 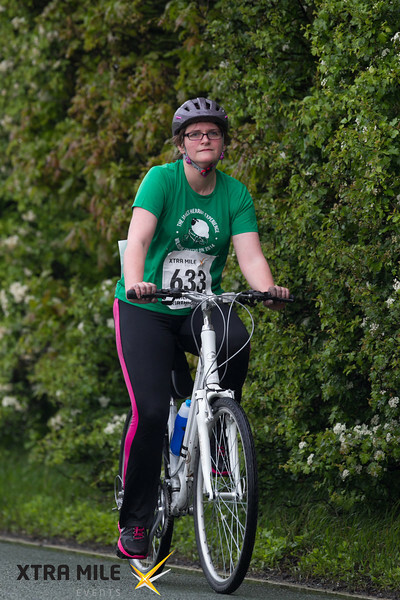 Swim successfully completed, Rachel decamped to the changing rooms to get warm, dry and into her bike outfit, while Steph ran out to the field and scrambled into her team t-shirt and shorts. The garb of the marshalls demonstrates the weather with which we grappled all morning! 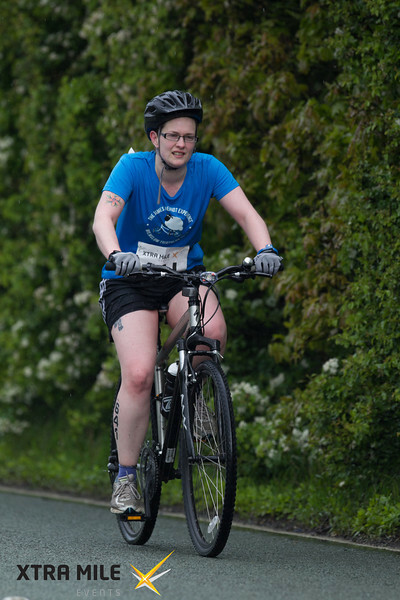 I piled on the clothing, slung my team t-shirt on top and tucked some energy sweeties into my bike top. Looking like a complete prat, I left the confines of the car park, and hit the road. The smooth tarmac of the A538 was delightful, but the experience was slightly marred by it being a dual carriageway with a 50 mph speed limit which was rarely respected. I was happier once we hit the country lanes and despite the hail, I enjoyed winding through the Cheshire countryside, watching angry grey clouds roll across open fields towards me and dodging the potholes and horseboxes. The organisers had obviously taken an ideological stance against providing competitors with any information about your progress on the course, which meant that when I passed Rachel (who was trying to fix the brake on her bike, having previously had to remove the wheel in order to replace the chain), I had no idea whether we were even half way round, and whether she would make it back in one piece. Of course, the guidelines suggested it was sensible to ‘familiarise’ ourselves with the course but in my case at least this had simply involved glancing at the map, recognising it was roughly a loop and that there were a few villages along the way. The hail had just about stopped hammering off my helmet as I turned a corner and found myself on the home strait. 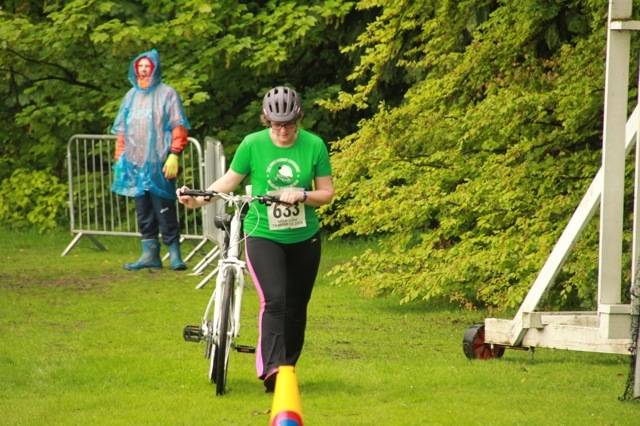 The appearance of my mum, Dave and Steph’s friend Lorna made for a great moment as they enthusiastically cheered me (and all the other competitors) back into transition. It was at moments like these that I felt properly sheepish. Why are they standing in the early morning wind and rain, watching me do things at which I’m not particularly good?! 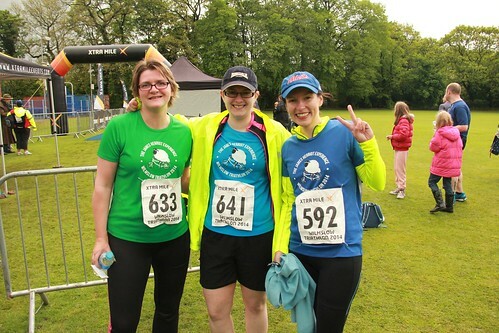 Steph had preceded me into transition, and Rachel was now following me, so Team James Herriot Experience was spread out through the suburban residential estate chosen by the organisers as the run route. I’d leapt off my bike at transition to discover that, in addition to the usual leaden legs, my feet also had no feeling in them. I left on the layers, added a baseball cap (multifunctional in case of rain, wind and even – being optimistic – sunshine) and trotted off into the woods and out into downtown Wilmslow. Awaiting us at the base of the hilly section was a marshall in an orange neon outfit of the kind worn by road maintenance teams; he warned us to dig deep and offered encouragement, or in my case, amusement – why was I still smiling, he wanted to know? A last loop through the woods and over the extremely slippery footbridge brought me back towards the leisure centre. The elite athletes were now hot on my heels and I met lots of serious looking people in stretchy suits coming in the opposite direction, starting their own runs. 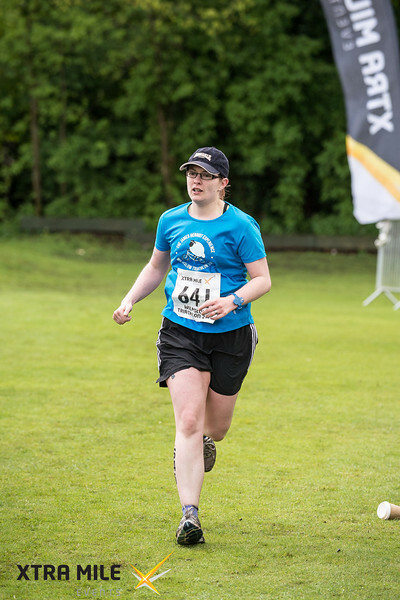 I sprinted for the line, then immediately inhaled the proffered jaffa cake (despite hating them), took my congratulations, and then cheered Rachel home not much later. The heavens opened and it seemed an appropriate time to make good our escape, for the biggest pub dinner any of us had had for a good while. 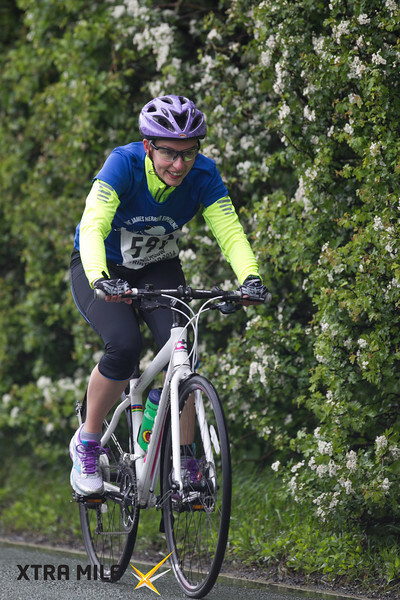 Massive thanks: to Rachel and Steph for humouring me; to Lorna and my mum for cheering us on through the awful weather; and to Dave, for being an utter stalwart, sorting all our bikes and even taking some pictures!